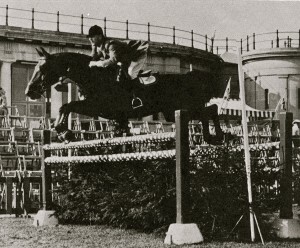 The video at the beginning of this blog is of Raimondo d’Inzeo at Rome 1952. The d’Inzeo brothers, Raimondo and Piero (pictured) were excellent representatives of the Italian method. Their father was a student of Federico Caprilli who is considered the father of the forward seat system. There are significant differences between the Italian, the French and the German methods. Like the horses they ride, each is different, serving a separate purpose. 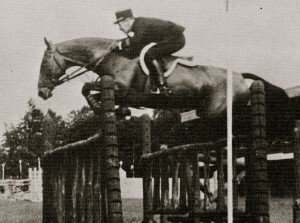 The following description is from “Riding and Schooling Horses” written by Harry Chamberlin . His description helps us understand why the seat taught at Fort Riley (the Balanced or Military seat) in Chamberlin’s day had to be a hybrid of the Italian and French methods. I’ve included photos depicting the seats. “Briefly, the Italian teachings are to the effect that; first, the horse should be allowed great liberty in the use of his head and neck, and no effort should be exerted, through training, to make him shift more of his weight to the hind quarters* than he naturally carries on them; second, the rider’s weight should be kept well forward over the horse’s shoulders, through inclining the body to the front. The Italians, therefore, go to an extreme, in that their horses receive little training to develop suppleness of poll and jaw, or to raise the head and neck in order to make them lightly-balanced1. As they carry much of their own and the rider’s weight on their forehands,’ it would be necessary to completely re-train them for use as polo ponies, or to bring out any of the brilliance and handiness which is developed by suppling the poll and jaw, and raising the head and neck. The latter training shifts a larger proportion of the horse’s weight to the hind quarters when at the slow gaits, turning quickly, or slowing down and halting. It produces a more clever and pleasant horse to ride; if it is properly done. For more than a hundred years, the French School for Cavalry officers at Saumur has been world-famous. Its seat has not gone to the extremes in forward inclination of the body and shortness of stirrup-straps that are found- in that of the Italian School. French horses receive far more schooling for the purpose of producing suppleness, brilliance, and handiness. When trained by good riders, they have delightful manners. In general, however, these horses, like so many of our own, in the Army and out, are over-bitted and poorly ridden. As a result, their necks are too much arched and over-flexed, with the attendant evils, to be described later. It is undoubtedly true that, except when executed by expert riders, too much collection and schooling are more apt to ruin a horse entirely, than are too little. As in the case of so many other things, the middle course in training seems the safest, soundest, and surest. 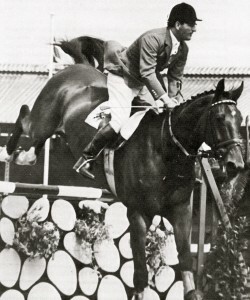 The Italian seat is, perhaps, for most horsemen, a little too radical, in that the stirrup-straps are always exceedingly short, and as will be shown later, the shorter the stirrup-strap, the greater must be the inclination of the body to the front, in order to ride in balance. 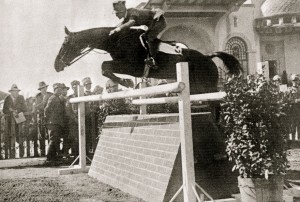 On the other hand, the French seat, which is apparently being modified in the direction of the Italian one, especially for jumping, still resembles somewhat that of the classic haute ecole.” The Swedish and German Schools correctly believe in long and thorough schooling, but teach the horse to take a very firm support on his bit. Their seats are not generally as far forward as the Italian one, nor are they, in consequence, as conducive to comfort and freedom for the horse. 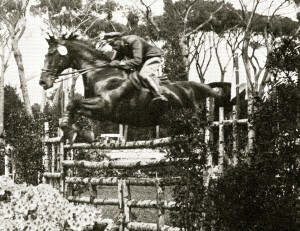 For jumping and cross-country riding, the Italians undoubtedly have the correct principles regarding the seat, but as regards principles of training and schooling the horse, those of the French are equal to, if not better than any others in the world. In the United States, a great many of our foremost riders in the Cavalry are following a system of training and riding which has sought to extract the best from all the foreign schools, and have added thereto the elements of value discovered here in the United States.